Brother Ali is just as beautiful on the outside as he is on the inside. When you talk, he listens by nodding in excitement with a nirvana-like smile that stretches across his face. He sports a primped beard that straps down the sides of his face and flows down his chin like a waterfall. I’m looking forward to this conversation because I’ve been a fan of his music for almost a decade and like Pac-Man I gobble up just about every hip-hop record he puts out or interview he does. Bassam and I met up with him and his son Faheem in their native Minneapolis for dinner at an Arab restaurant by the mosque we prayed at. I order a few platters for everyone and within minutes our table is toppling with luscious plates of lamb shawarma, beef skewers, roasted chicken and kabobs. Hands start flying in every direction grabbing food as our conversation begins. 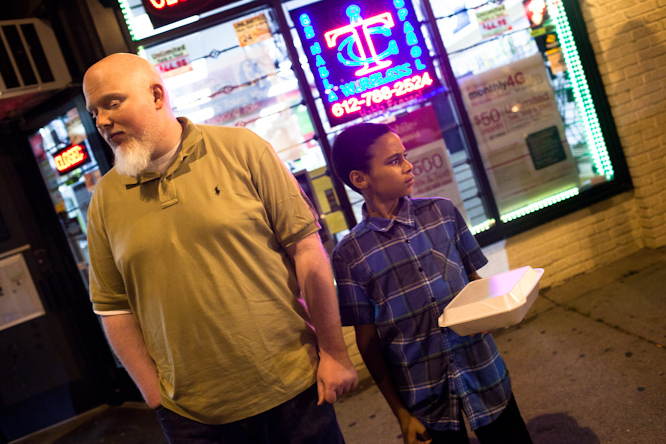 “Your son is a beast,” I say to Brother Ali while pointing to how much food his son was eating. Faheem smiles and grabs a bottle of hot sauce. “Sometimes at home my mom will have to raise her voice at me because half the bread is gone from all the hot sauce I eat” Faheem said as he puffed his chest. Brother Ali was born with albinism, a genetic disorder that takes away pigment in your skin, hair and eyes. He’s also legally blind. He had trouble fitting in at school because he didn’t think there was anyone he could relate to. “I was that one Indian kid at my school,” I chimed in. Being teased about his appearance was tormenting, he said. Until he was seven years old when an African American woman at school told him something that he still remembers to this day. Intrigued by what she said, Ali began hanging out with the black kids in school and cracking jokes with them. 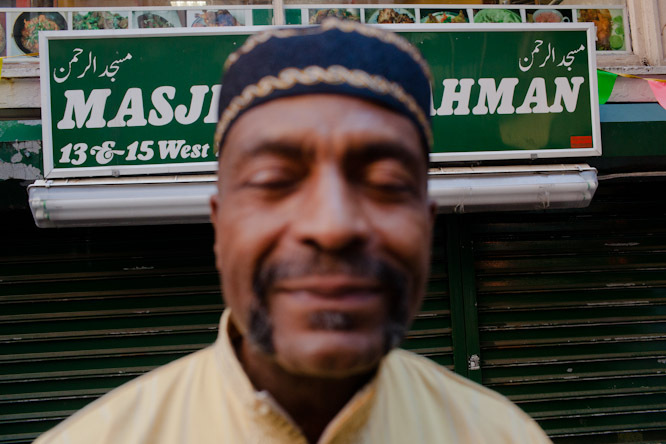 Hanging out with African Americans started his journey on finding his identity which became even more clearer when he became Muslim in the late 90s. Ali may be white but has said repeatedly in interviews he credits the African American community for raising him. I’ve heard him make that point a lot and was intrigued to find out his reasons why. Ali is on fire right now dropping some serious knowledge on this table and I insist he eat some shawarma in front of him before it gets cold. 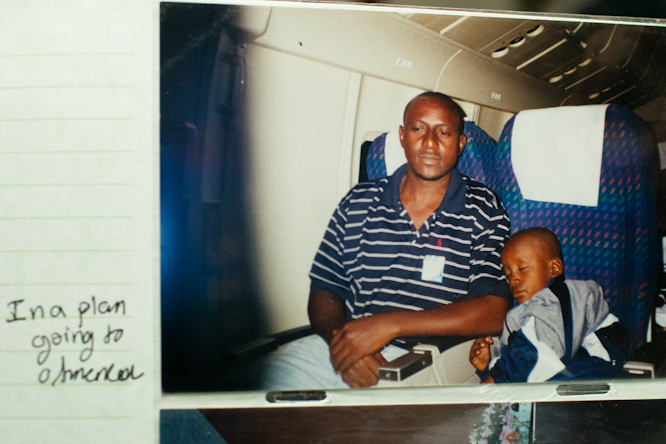 Brother Ali’s early records focused a lot on his identity struggles and his rocky upbringing. As he started gaining buzz among fans he didn’t expect he’d have, kids from privileged backgrounds that didn’t have even a remotely similar upbringing compared to his. His more recent albums focus heavily on his spirituality, social justice and the connection between the two. Now, times are good for he and Faheem. Ali tours the globe regularly to a steady fanbase and Faheem comes along too whenever he can. There’s a school of thought out there that says to be a good artist, you have to be dealing with tragedy or torment. Since times are good for Brother Ali, Bassam and I asked him how that impacts his creativity on the mic. He said he turned to the Sufi traditions within Islam to learn there was a whole new world of expression he could explore. I work as a standup comic and I’ve always admired Brother Ali’s stage presence. On stage early on in my career, it’s easy to constantly overthink about everything like “Am I talking too loud?” or “Am I standing to straight?” or “What am I going to say next?” But when I first saw Brother Ali perform at a hiphop show I went to in 2004, I couldn’t help but marvel at how much fun he was having on stage. He was in the zone, dancing on stage and even grabbing the mic to do a quick beatboxing session. One of the most difficult things to battle with as a public figure is ego. I have nowhere near the success as Brother Ali does, but it’s a constant struggle to keep yourself in check when people are constantly coming up to you to say they like what you do (or in some female cases they like you period). I asked him how he’s been able to handle his ego battle. When fans ask for his autograph, he said, one of the things he does to check himself is sign his name with Arabic phrases underneath like “Alhamdulillah” (All praises are for God) or “Allah Akbar” (God is the greatest). It’s time for the Ramadan Taraweeh prayers at the mosque and Brother Ali wants to leave the restaurant and head over there. I noticed he barely touched his food and carries it outside in a box with his son. 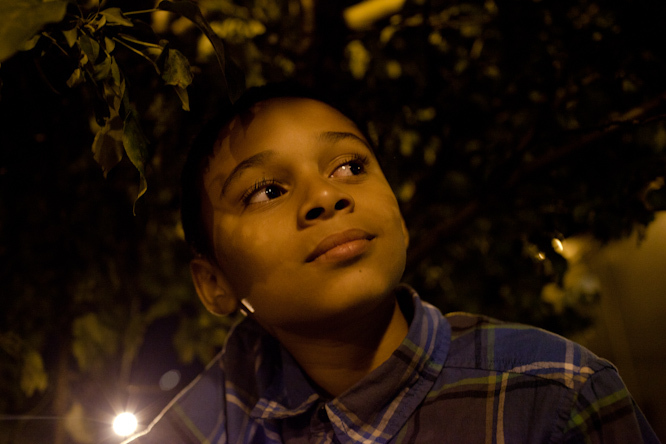 “Dad, I think we should feed this to a homeless person or someone else in need,” Faheem said. While Ali attends the Taraweeh prayers, I duck out of the mosque and make a quick food run for him with a friend. After the prayer finishes, I hand him and his son a halal Stromboli stuffed with pepperoni, beef sausage, lamb gyro and chicken. Ali bites into it and pauses. “That’s what’s up,” Ali beams with his smile. But Ali can only get a few bites in before Faheem devours the entire thing. “I told you, the kid is a beast.” I said. I’m going through my notes from my conversation with Ali right now and keep saying to myself “Damn, I didn’t fully realize what he said until rereading it now!” I don’t even think I’ve typed up half of the things we talked about because we covered so much ground over the course in 45 minutes. It’s the exact same thing he does with his music. He orchestrates his insight into the human experience in ways that only he is capable of doing. But I say all this not as a fan nor as an attempt stroke his ego. But rather, as his friend. At first I thought to myself “Ok, we’re friends now because we hung out and I got his phone number.” But then I realized I’ve been connected to him ever since I stumbled upon one of his records over 10 years ago. It’s people like him that helped me embrace my own identity and make sure I feel good about the work I do and make sure it is done to please God most importantly. I don’t know how successful I am on this objective, but I’m blessed to know he has always been here to help me in the process. I listened to Brother Ali’s music as i read this. Makes the read so much more better! Weirdly, I was listening to Bro Ali as I opened my computer…. Just beautiful. 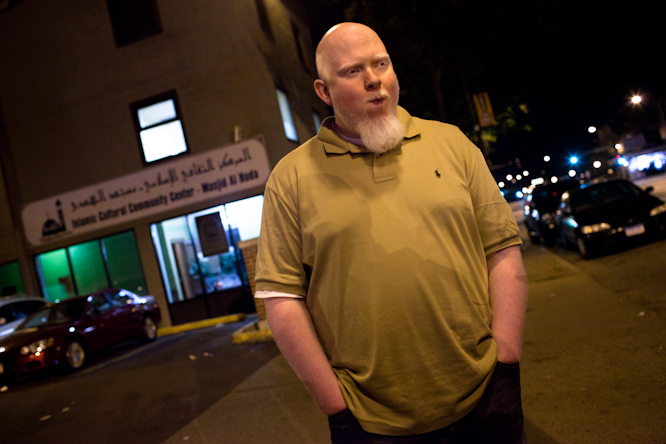 The Brother Ali interview was awesome, but I have a small favor to ask – where did you get halal stromboli? MashAllah Bro Ali is amazing, Ive had the pleasure of hanging out with him and he is a beautiful person inside out. Keep up the great work gentlemen. Jazaks. I love this interview. It’s a great thing to see the artists in our community get a spotlight. I’ve never had the pleasure of kicking it with Brother Ali but I feel like I know him from listening to his records. Good man. I was reading this while my 10 month old was playing nearby. I linked to Brother Ali’s website, and decided that why not, lets play the music on the page. …all I can say is…I’m sure he was going to hear some of the words eventually..so I’m gland they were from a Muslim! FYI- The only TV/Radio he had listened to so far was PBS/NPR..big change…he like the tune though! The NPR station here in Minneapolis loves playing his music (thecurrent.org). I think the record with your little one still stands. Brother Ali is amazing, JazakAllah for finding him to do the interview and getting an interview from an Islamic perspective. Br Ali, may Allah give you what is khayr. I met you when you came to Australia many years ago and InshAllah will meet you again, next time you are down. Truly brilliant. This made me smile alhamdulillah. Yaseen! Buddy. Do you remember me. Adrian Cullen from angel fire ski resort. I still have the dread you gave me the night before I left. Sup man. Look me up on Facebook or give me an email addy I can write to you. Brother! I enjoyed hearing ‘Forrest Whitaker” on the Jimmy Carter biopic “Man From Plains”, a must see film. Nice to see Brother Ali enjoying some success. But a word on the Sufi path: Allah did not put us on the earth to suffer – He is very clear about that (Have We not made the earth as a wide expanse, so travel to escape living under oppression, or words to that effect). Although struggling is what Allah has promised that our lives will be, suffering is not something that Muslims are simply supposed to accept. I’m keen on all of these コーチ these are generally that being said sweet with regards to have not seen everything want it long before! they are surely excellent! This is certainly somewhat real time as increased throughout the site. Admire discussing in and around.